We offer a wide range of hotels near Los Angeles Clippers from cheap accommodation to up market luxury hotels. Search our database of hotels to find the lowest rate for your stay closest to Staples Center. Located less than 1.6 km from the Staples Center and Nokia Theatre, JW Marriott Los Angeles L.A. Live offers luxurious rooms with a 42-inch flat-screen TV and Wi-Fi access. Facilities include an outdoor rooftop pool. This central Los Angeles boutique hotel is located across from the Microsoft Theater, Staples Center and Conga Room at the LA Live Entertainment Center. Free Wi-Fi and an on-site spa services are featured. Offering an on-site fitness centre, Residence Inn Los Angeles L.A. LIVE is located in the city centre of Los Angeles. Less than a 5-minute walk from the Staples Center, this hotel features free WiFi access and a concierge service. 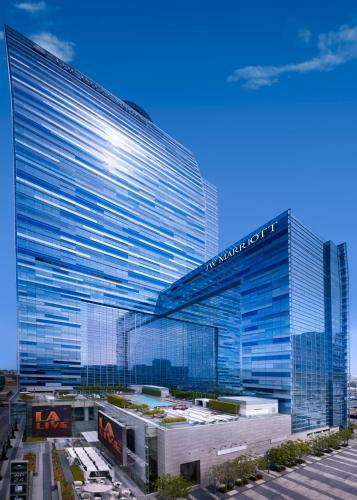 Located in downtown Los Angeles, just a block away from the Staples Center, the Ritz-Carlton Los Angeles offers luxurious rooms with marble bathrooms, flat-screen TVs, and iPod docks. 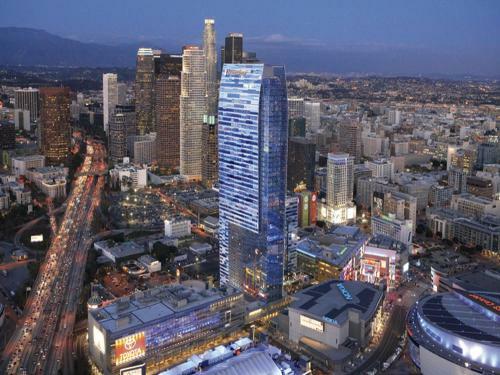 Located in Los Angeles, Corporate Suites in Downtown LA near Staples Center offers an outdoor pool and a fitness centre. This self-catering accommodation features free WiFi. Staples Center is 300 metres away. Secure Reservations at all USA Basketball Arena Hotels Room availability and hotel rates can be checked online prior to making a secure reservation - just click on the "book it" button. Your credit/debit card is not debited until you finish your stay. © 2010-2019 BasketballHotels.net. All rights reserved.